World’s first RGB white light, analog modulated beam array with real scanners. This allows for completely new effects that could have never been created before: Wave effects of parallel beams, three-dimensional twists of beams in mid-air and spectacular color-fades make the RTI NEO SIX RGB a spectacular new lighting effect for professional stage productions. Special effect rental for e.g. production companies. 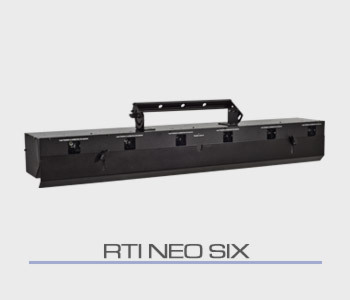 The RTI NEO SIX is a special effect that can be controlled by DMX and is often rented by production companies in particular to create extraordinary effects on stage. With the RTI NEO SIX you rent a visual effect for stages and live performances, which also shines bright in clubs and discotheques. Contact us now to get your individual rental price for the RTI NEO SIX. Special effect rental for e.g. production companies. The RTI NEO ONE is a DMX controlled show laser that is often rented by production companies in particular to create extraordinary effects on stage quickly and easily. With the RTI NEO ONE you rent a modular laser system that is ideally used on stages as well as in clubs and discotheques. 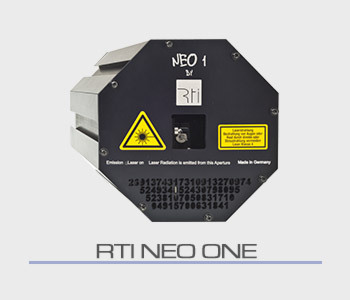 Contact us now to get your individual rental price for the RTI NEO ONE. The tarm DOT multi effect laser projector is a whitelight pure diode solution with analog color modulation and unique glass effects. Effect lasers rental for e.g. production companies. 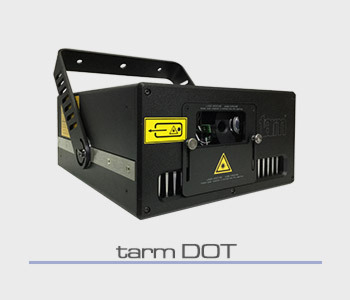 The tarm DOT is a DMX controlled effect laser, which is especially rented by production companies to provide extraordinary effects on stage very simply via DMX. With the tarm DOT you'll rent an easy to integrate laser effect for stages and live performances, which can also be used very well in clubs and discotheques. Contact us now to get your individual rental price for the tarm DOT.